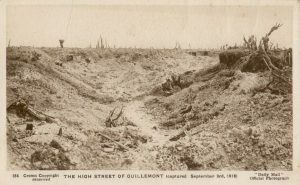 The attack on Guillemont was launched at midday on the 3 September under the protection of a creeping barrage (of 25 yards per minute) and was part of a wider attack. The Battle of Guillemont was primarily intended to distract German attention away from the Romanian front where the Romanians were coming under increasing pressure. However, the capture of Guillemont had been repeatedly attempted earlier in July and August and had failed on each occasion. With its maze of underground tunnels, dugouts and concrete emplacements, Guillemont was a fortress and a tough nut to crack as the earlier failures indicate. The attack on 3 September finally saw Guillemont fall to the British however, other targets of this wider attack, such as High Wood and the Schwaben Redoubt failed and remained firmly in German hands. 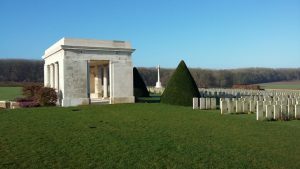 On the banks of the Somme the French succeeded in taking the villages of Clery and Omiecourt. The attack continued until 6 September, with the British capturing Leuze Wood (referred to as ‘Lousy Wood’ by the troops) on 4-5 September, some three miles east of the 1 July front line. The French meanwhile captured a further village, Bouchavesnes, on 4 September.